Is there any name for a pizza place more fun than Pizza Castle? What a wonderful name for a wonderful little place. Pizza Castle is located the Gage Park neighborhood on 55th Street between Spaulding and Sawyer avenues. Despite its location in a small strip mall, the surrounding streets are lined primarily with brick bungalows and sturdy two-flats. Gage Park is found south of the Stevenson Expressway and borders the neighborhoods of Brighton Park and Archer Heights to the north, Back of the Yards and West Englewood to the east, West Elsdon to the west, and Chicago Lawn to the south. While other pizza options really aren’t too far away, they are all still a bit of a hike if you don’t have a car (Geneo’s is somewhat nearby, though east of Kedzie). 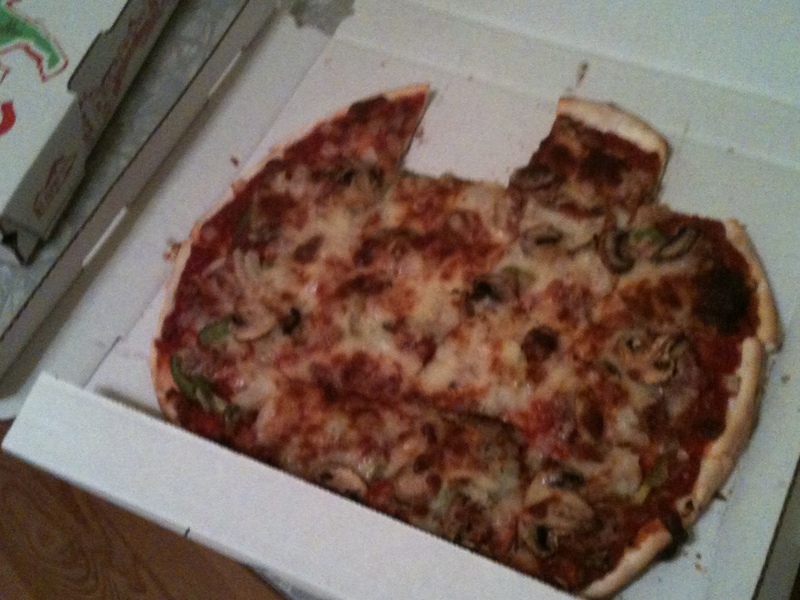 So, with it’s location and years of dependability, Pizza Castle reigns as the pizza king for the heart of Gage Park. It’s really a shame that we didn’t get more photos of this place, especially of the inside, which highlight the important place the family-oriented pizza joint occupies in a city neighborhood. 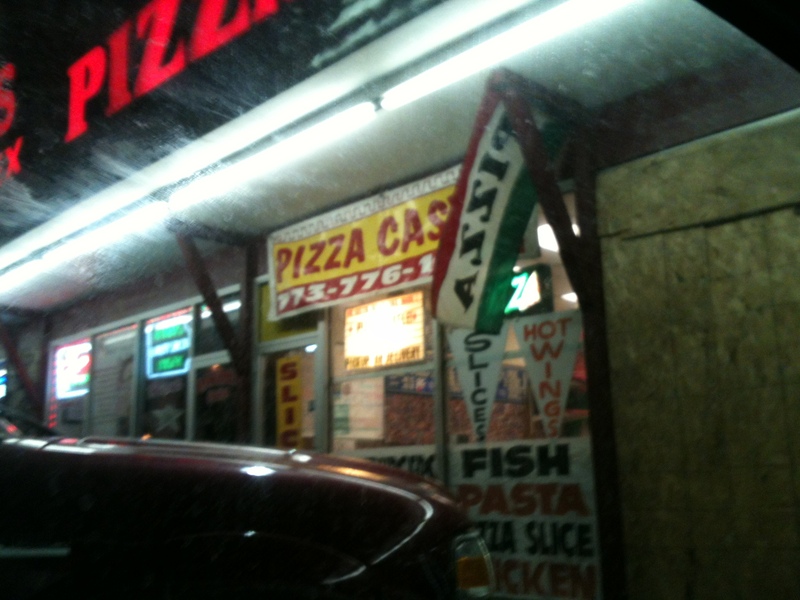 On the outside, Pizza Castle makes the best use possible of a strip mall storefront. The windows in the front have a number lights, flags, and signs alerting passersby to delights available inside. A lot of the text on the signage appears to painted in what appears to my eyes as an older, less common typeface, giving the exterior of Pizza Castle a classic look. The inside is the real treat, though. Colorful, bright, and inviting, it was the perfect antidote the rainy night we encountered outside. Behind the counter is a big oven, with several workers in Pizza Castle t-shirts making dough and tending to baking pies. It was clearly a busy night when we arrived. A delivery driver or two waited for orders, but were soon out the door. A small side counter with stools to stay and enjoy a slice is available, too. It is much cozier inside than the outside suggests. In addition to the typical logos of Chicago’s beloved sports teams, the walls are covered in fantastic framed collages of Pizza Castle’s customers and neighbors. With seemingly thousands of happy, smiling, and (presumably) local faces, I couldn’t help but feel like the Pizza Hound had made the right choice for our pizza run. Check out the official Pizza Castle Facebook page to see the wonderful collages. The menu features all the standard toppings, as well as the classic Chicago Italian beef. Double dough is available for a thicker crust. As usual, Ernie and I stuck with the typical Chicago-style thin crust, but instead of the usual pepperoni and sausage, I wanted a little more variety. So, we got Pizza Castle’s version of the standard Chicago special (sausage, green peppers, onions, and mushrooms) called the King Arthur! The king and the dragon delivered the goods! 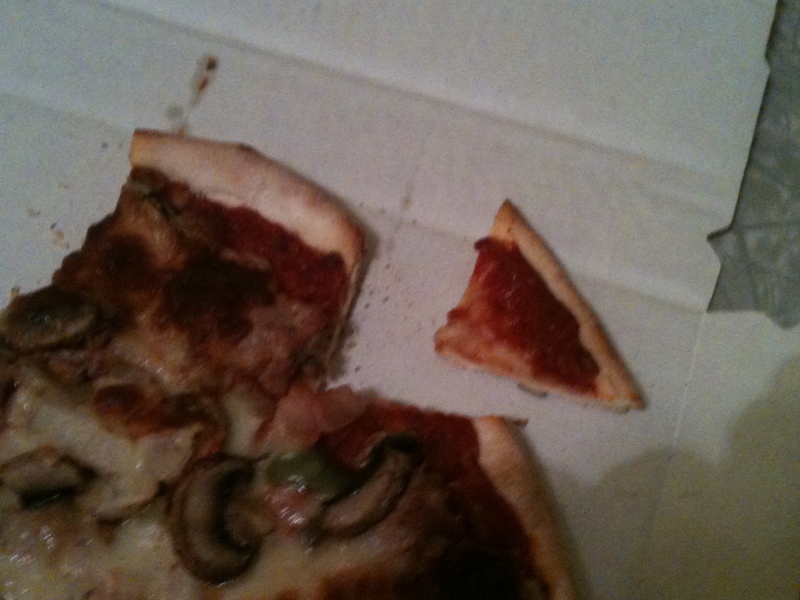 And of course the Pizza Hound needed his own piece (crust and sauce only)! Pizza Castle makes their own sausage, which was delicious and a highlight of the King Arthur. Since we weren’t sure when we’d make it back to Pizza Castle, we naturally got two pizzas. The menu highlights the popular choices of sausage, spinach, and just cheese, but we opted for pepperoni. While the thin crust was good, the stuffed pizza really stood out. Delicious crust and cheese, and really one of our favorite pizzas we’ve had on our adventures. Pizza Castle has gotten some well-deserved attention in the Chicago area in the last couple of years, and according to their Facebook page they were just filmed and interviewed by Andrew Zimmern of the Travel Channel! Wow! No bizarre food here; just great pizza. Not bad for a local South Side pizza joint! Deals on wings are to be had at Pizza Castle, t00. Not to mention pasta, shrimp, perch, and the standard fried stuff. Don’t forget your free RC Cola with every large and extra large pizza! 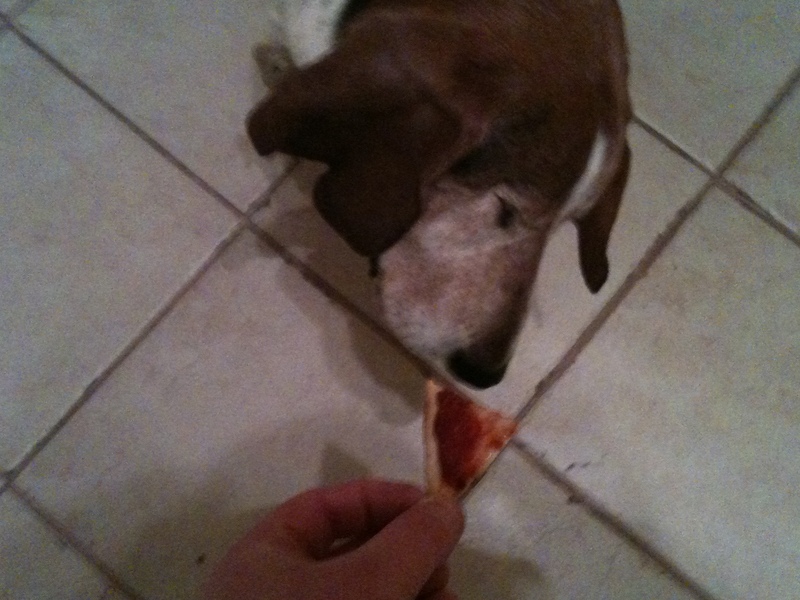 No doubt about it, the Pizza Hound loves Pizza Castle.